Yee in front of the United States embassy in Kyiv. During her time at The New School, Sarah Yee, BAFA Photography/Global Studies ’16, studied international organization in Berlin and urban development in Shanghai, while also working on cross-cultural photography projects in Beijing, Saint Petersburg, and Moscow. 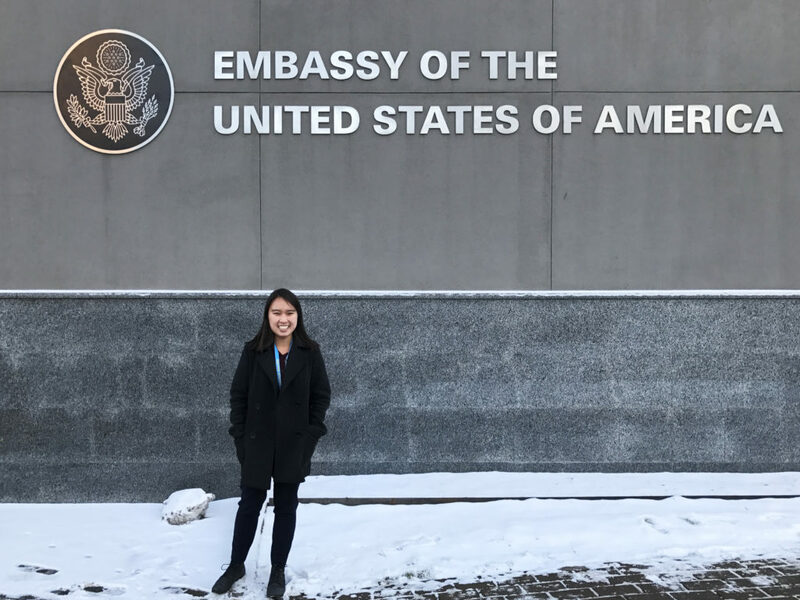 After completing two internships with the U.S. State Department, Yee recently applied for and won a prestigious Thomas R. Pickering Foreign Affairs Fellowship. Funded by the State Department, and administered by The Washington Center for Internships and Academic Seminars, the fellowship provides undergraduate and graduate students with financial support, mentoring and professional development to prepare them academically and professionally for a career in the U.S. Department of State Foreign Service. Yee will begin an MA in International Affairs this fall at George Washington’s University’s Elliot School, which in addition to her time as a Pickering Fellow, will help prepare her for an eventual career in Foreign Service. She will also continue to intern with the State Department, work with a mentor, participate in professional development, and study United States foreign policy, as well as courses in the Europe, Eurasia, and Russian programs at GWU.